Luigi Meregalli, born in Carate Brianza (Milan), has painted for more than 40years. Early in his youth his interest and passion for art begin to grow. When he finishes the junior high school, he begins his technical studies suggested by his parents. In the 70s he moves to Riva del Garda where he works in the precision mechanic industry and, at the same time, he grows his natural artistic vocatio. Meregalli learns the drawing and painting foundations attending the courses held by the master Mariano Missaglia from Venice. In 1976 he meets sculptor Aroldo Pignattari and joins the historical cultural association of Riva del Garda “Gruppo amici dell’arte” (“Friends of art group”). Enchanted by the beauty of the places of the Garda lake, he starts off in art by exhibiting paintings with landscape subjects. In the 80’s, thanks to advisories and rewards won in regional contests, he receives the first eulogies from the critics. During this time, fascinated by this technique, turns his attention to the study of the watercolour discipline, which permits to express at its best his research made by poetry and transparencies. With the watercolours he’s able to obtain “wonderful communication and untouchable atmospheres artworks” , as Paolo Levi writes in the volume “Immagine e Struttura” (Image and Structure), published by Giorgio Mondadori. From then, watercolours has been his favourite technique because it is the most similar to his artistic sensibility. In the nineties he alternates solo and group exhibitions of ever greater importance, in Italian and foreign cities, such as Vicenza, Udine, Florence, Rome, Venice, Bologna, Milan, Ferrara, Naples, Genoa, Bensheim (D) and Burghausen (D). In 2002 the Department of Culture of Arco organises a profound personal exhibit in the Palazzo dei Panni called “La costruzione di una preziosa trina” (The construction of a precious lace), an important event that earn lots of public and critics approvals. Unfortunately, the premature loss of his wife Manuela clouded this event. 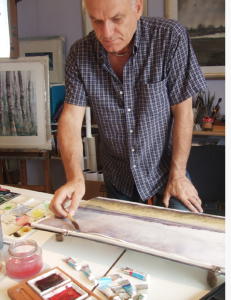 After some difficult years, in 2004 he joins the “Associazione Italiana Acquarellisti” ( Italian Watercolourists Association), participates actively to almost every exhibit of the national association, and he’s still collaborating with appreciated personal workshops. In 2010 he organises a unique exhibition at the civic gallery “G. Craffonara” in Riva del Garda with 3 of his 4 creative children entitled “Ritratto di famiglia” (Family portrait), where were shown painting/graphic/photographic and narrative artworks, proving that in his family everyone has his own role and a specific artistic language. In the same year he’s been invited at the Museo della Carta (Paper Museum) in Fabriano to show his paintings for the Watercolours International Prize “Marche d’acqua”, where only about thirty artists selected throughout Europe can take part. In addition to his personal growth in the world of art, he continuously follows with dedication the group “Amici dell’Arte” of Riva del Garda, up to accept in 2012, 2014 and 2016 the role of President of the Association, contributing with his organizational experience to improve the management of the Group. Since a few years he also teach painting and watercolours in several courses. His artworks are present in private collections in Italy and abroad. Meregalli is reviewed on periodical, magazines and mentioned in important annual reports and contemporary and modern art catalogues.